It is a truth universally acknowledged that a female over the age of 12 must be in want of a bathing suit that doesn’t make her look slutty. Oh.My.Gosh. To say that I loathe shopping for swimwear is a gross understatement. 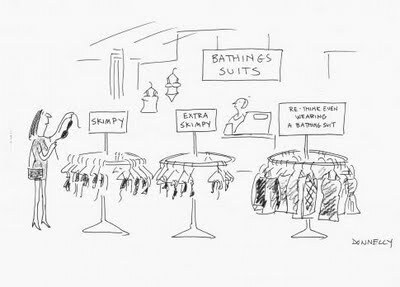 That’s why I shop by mail order, ordering my swim minis from Lands’ End Overstocks and trying them on in the privacy of my closet. But now I’m living the horror vicariously through my sweet 13-year-old daughter. Maggie needed a swim suit for camp. Last year she made it through with a cute striped one-piece from the Target girls’ department, but no more. My baby hovers on the edge of puberty and all the joy it entails. She’s in-between – too big for girls’ suits but not quite ready for a juniors’ suit even, at least not some parts of her. This is not a new yearly dreadfest – no, we first encountered it in 2009. Read about that here. Our first stop on the annual Trip of Shame was Target. Now, seriously, Target is my happy place. But not that night. Maggie and I visited the juniors/women’s bathing suit department, and I was thrilled – thrilled, I tell you – to discover that Target now sells swimming suits made with Spanx, or at least a Spanx-like material. I held up a black-and-white suit with a Spanx bottom and long fitted tunic top. My description doesn’t do it justice. It was really cute. She eyed it critically. “These look like Mom underwear,” she said. She sighed. “Fine,” she said. “I’ll try it on. And this one, too.” She grabbed a polka dot tankini. We headed for the dressing room. Like a dog in a fire hydrant store, I lost focus a few times on the way there. Target does that to me. That’s why I usually go in for one thing and end up with a new shower curtain, six tubes of toothpaste and some super cute shoes. So I found some cute dresses on sale that I wanted Maggie to try, too. Because I really like disappointment, apparently. I know that the child only wears dresses under duress, but they were SO CUTE. And I knew she’d look awesome in them. I made it to the dressing room just in time to hear the primal sound of a woman squeezing into a swimsuit. It’s a lot of grunting, exasperated sighs, light weeping, and then a few choice curse words. I knocked on her door and implored her to let me in. She did. I slipped in. She glared at me. “I hate this,” she said. “I hate everything about it. I hate my stomach and my thighs. I can’t wear anything.” She crossed her arms over her chest. I tried to explain that no normal woman likes it. I mean, what is a swimming suit but basically underwear made out of Lycra and Spandex? Are we a society who likes walking around in our underwear? No, we are not, not really. Oh, sure. There’s always the exhibitionist who enjoys baring it all and usually has a YMCA membership, or the super-skinny skank with various Chinese-like tattoos on her nethers who looks good until her skin starts losing its elasticity. But most of us would rather not walk around vast bodies of water with nothing but a thin layer of nylon keeping our saggy parts from breaking out. Suddenly, inspiration hit me. Next year, no camp that requires one-piece swimming suits for all female campers. Next year, it’s Amish camp. I think that dress’ll work just fine for that one. I’m dreading the day my daughter grows out of the girl’s department. The only thing good about it will be I no longer have to ever again enter that trampy Justice store for girls. I’m just not sure where to shop for Maggie! Heya i am for the primary time here. I came across this board and I in finding It truly useful & it helped me out much. I hope to give one thing back and aid others such as you helped me. I am really impressed with your writing talents as neatly as with the format for your blog. Is this a paid subject matter or did you modify it yourself? Anyway stay up the nice high quality writing, it is rare to see a great weblog like this one these days..